I love the 'chippy' look that Miss Mustard Seed's milk paint creates. Today, the paints are easier to get, and very easy to use, and you can achieve these great aged looks in only hours. Milk Paint Distressed Furniture In Hours! 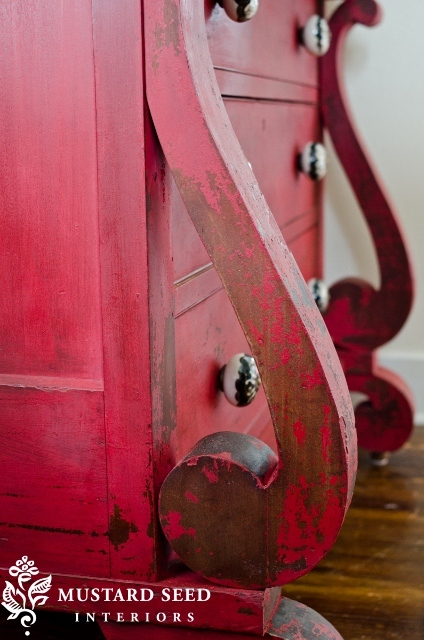 Imagine wonderfully aged and distressed furniture in hours not centuries! Miss Mustard Seed's Milk Paint give a wonderful distressed chippy look. If you love rustic, aged furniture looks then the video below is for you. Marion, from Miss Mustard Seed, describes how you can get that very look, what to do if your paint doesn't chip and how to use milk paint without the chipped look. In many ways this appears more authentic than the sanded distressed look. This simple paint gives a unique finish every time. That is a blessing and a curse because the results are not easy to replicate. This makes it frustrating if you want a seamless, uniform look, but it does mean your pieces will look very authentic and distinguished. Love the chippy look? Milk paint gives a fast DIY look in just hours. Once dried you can add different paint layers to create beautiful looks, allowing different colors to peek through. Use linseed oil or wax to protect your pieces. This paint starts out as a powder until you add water, then its time to get the lumps out. If you are doing it by hand its a tiring process. The paint will still be rather thin, and a little clumpy. It dries super fast, so you must work quickly to get the coverage and color you want in seconds. Your first layer of paint will be on and dried within minutes. If you are painting a piece larger than a foot stool, use a blender to mix your paint. Your first layer will not be your last. Whether you are painting something dark to light or even light to light, you might need anything up to 5 layers of milk paint before you get the results you want. Make sure you have enough paint to finish the job first time around. Mixing proportions to get the color you want next time around is not always easy, so try to have enough paint to finish your piece, otherwise it could look patchy. The paint distresses easily, so its best to be very light handed when you distress your piece, or you could take off more paint than you really want. The finish is worth the effort. The wax goes on easily but its the result that really speaks to you. The unique sheen, character and colors are so beautiful, its worth all the uncertainty. Enjoy the process! Don't forget to see Martha Stewart's milk paint tutorial here.